I joined Mensa at the very end of 1990, and my first gathering of any sort was the Heartland AG in Kansas City the next summer. There I heard of a Mensa couple — with names that meant nothing to me — getting married right there at the AG. What sort of persons could these be? They turned out to be Allison and Randy Stallings, and I soon found out what sort of people they could be. Randy, as you've all probably learned by now, was taken from Allison and from all of us in a scuba accident in Mexico last November. Newer members may not know Randy very well; he had been a bit scarcer after doing something many of us might dream of: he bought the company he worked for. But before he did that, he had had a full cursus honorum of local group service. 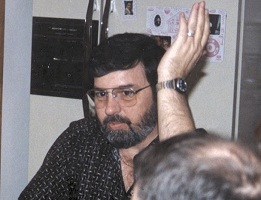 Randy co-chaired HalloweeM in 1992 and 1993. Following those successes he was twice elected Loc. Sec., and thereafter was entrusted with the high and sacred office of Game Warden. It was during that period when he went above and beyond the expected performance level when he brought Mind Games to Chicago for the first time. Not only did Randy do all the local arrangements that a Mind Games chair is responsible for, he also went out and hustled games to be entered — something later chairs left to the national office. It was around that time (1997) that I started to come out from under the rock called "had babies." Then I got to see Randy and Allison a bit more often. Randy was a great person to sit with at the gaming table. Not only was he a gracious and frequent host, and a sportsman in victory or defeat, but also because the "get Matt" mechanic that operates in the western suburbs was replaced by a spirit of "get Randy." That meant at least as much to me as the croquet field, the pinball, and the gingerbread houses. But all of that put together does equal the kind, hard-working and even-tempered spark we've lost. RandyStallings.php last updated January 27, 2019.